1. I finally watched that “Gangnam Style“ video that is apparently the most-watched and most-liked video on YouTube. My first thought upon seeing it was, “What’s so special about this? This looks like any other weird foreign music video on YouTube.” Well, it’s still not bad, and I need to work on my ferret character’s design before I start actually drawing the comic, so here’s this. 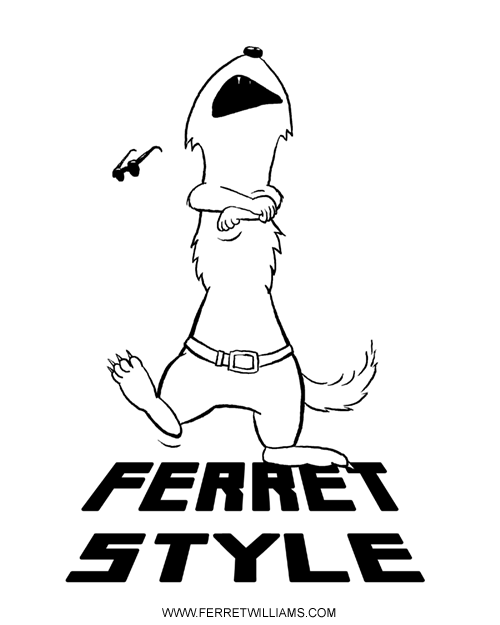 Also included is the rejected first draft, which didn't look enough like the ferret I had in my head. Too anthropomorphic. 2. I’m now on deviantART under the name “FerretWilliams”! I’ve been there for 5 years as “willyums”, but I hardly posted anything. Now, with the beginning of my new Ferret Williams comics, I’m going to try it again. In May of this year, deviantART finally started offering the ability to CHANGE YOUR USERNAME, with a premium membership. I didn’t find out about that until I was about to create a new account and decided to check once more if it was possible. Last time I checked was in December 2011 when I was changing my username on every site I’m active on. Since I wasn’t active on DA at that time, I saw no reason to create an empty account. FA and IB will still get more content than DA, simply due to the policies on mature art. The only thing that IB users will miss out on is photos, since there are strict policies on those here. I rarely post photos. So far, I'm getting into DA pretty well and have fav'd a LOT of My Little Pony art. That has taken a lot of my time tonight, heh. I'll give it until the end of my premium membership(required for a name change), then I'll decide if I stay there. So far, so good. 3. In other news, I’ve noticed two other comics that have gone a similar route as mine, with the announcements all within 2 months of each other. Lizardbeth of Broken Plot Device, Tim Buckley of Ctrl+Alt+Del, and I have all decided independently that our story-based comics will be better off as complete stories, and to have a wider variety of stuff. I don’t know if this is the beginning of a trend or if this is something that many webcomic creators have done before us, but the timing surprised me a little. Granted, I’m nowhere NEAR as popular as them, especially Tim. I have roughly 600 subscribers across various websites(some are duplicates, some are Twitter bots) and less than 100 visitors/day to the main website, so I’m hesitant to even include my comic in this coincidence and call it a trend. Liz is doing a variety of projects and releasing them as they’re complete, while Tim is focusing more on different characters as a gag-a-day comic(they were previously side characters) for the regular updates and rebooting the continuity of the storyline-based characters and releasing stories as they’re complete. I’m focusing more on a new character in a different setting while posting a variety of projects as they’re complete(including animations). I’m curious if we might see a surge in changes to several comics, mostly inspired by Ctrl+Alt+Del, as it’s the giant. Small updates with a long storyline have worked well for online cartoonists for over a decade, but if done right, large chunks farther apart can still draw in the readers and be more enjoyable for both parties. This typically doesn’t grow an audience as well, which is why I’m also doing regular black and white comics(among many other reasons), but it can be done.